How large and how heavy is your product? Which quantities may we offer you? Please provide us your contact details. We will get back to you shortly. All packaging products developed and produced by DREI V are tested according to the DREI V testing standard before going into production and being sent for consignment. Only products that meet or exceed these exacting standards go into production. Our products are designed with self-adhesive closures for fast and professional packing and shipping. Moreover, with the tear strip designed into the seal they are just as easy to open for the recipient. “Never settle for second best”. Ever since the company was founded in 1982, this has been DREI V’s daily motivation and aim. Postage-optimised packaging and the elimination for the need of further packaging materials like padding paper help our customers to save money. All our packaging is produced using environmentally friendly methods, and they can simply be disposed of for recycling as they are, without the need for further separation. 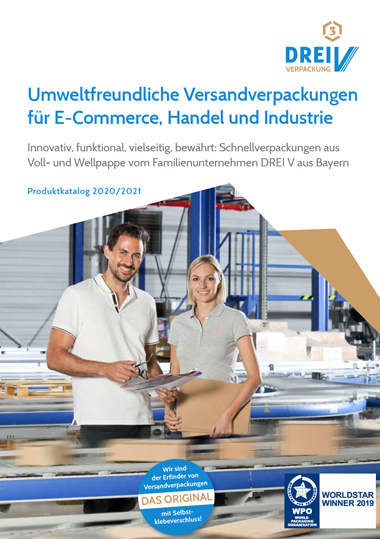 For sending automotive small parts, DREI V offers easy to handle packaging with a high degree of flexibility and security. Your product is safely packed in a closed film pouch inside the die-cut packaging or secured inside a fixation package. From CD packaging to packaging for records and other audio media, DREI V media packaging guarantees the safe packing of various media formats for shipping. Electronic data media such as CDs, CD-ROMs and DVDs can be fixed securely and sent with extra piece of mind thanks to the security closure. Whether it’s printed products, cosmetics or textiles – packaging developed specially for online shopping allows all kinds of items to be shipped quickly. Innovative product qualities such as the self-adhesive closure and the tear strip provide maximum ease when packing or returning items. The DREI V fixation packaging is well-suited to the shipping requirements of extremely sensitive medical technology. Special membrane packaging with LDPE films has been designed for these purposes, also ensuring great handling advantages in addition to extreme security. Laptops and tablet PCs are secured in fixation packaging with shock-absorbing features and enhanced edge protection. Electronic small parts can be safely fixed with a non-slip, transparent film, which not only optimally secures them but also presents them well for the recipient.